Earlier this afternoon, multiple calls to 911 reported heavy, dark smoke coming from a location off Horse Tale Drive, between 175th Avenue and Tile Flat Road in the South Cooper Mountain area. 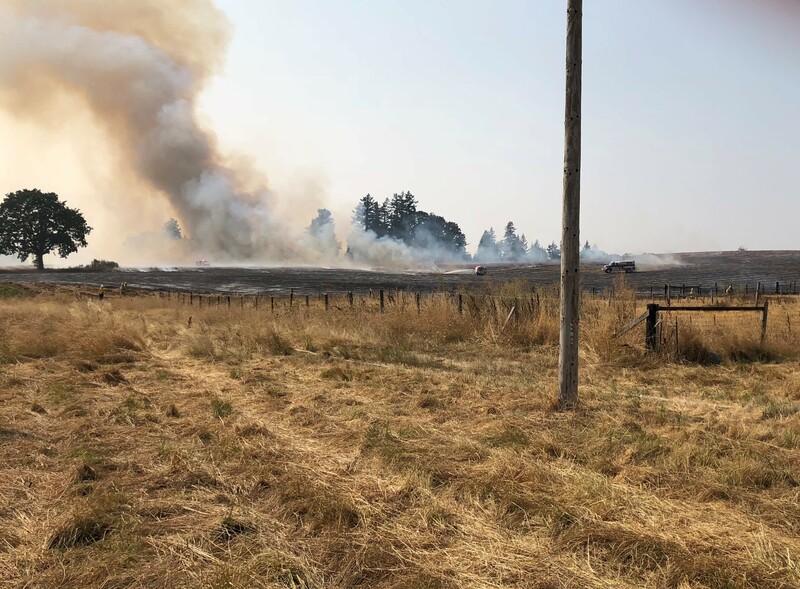 Tualatin Valley Fire & Rescue firefighters from the Cooper Mountain fire station arrived within minutes of being dispatched to find multiple acres of a cut hay field on fire with flames spreading quickly due to shifting winds and significantly dry vegetation fueling the fire. Based on descriptions provided by 911 callers and the size-up from the first-incoming crew, the call was immediately upgraded to a first alarm to bring in additional firefighting resources. Firefighters battled the fire with brush rigs, surrounding the perimeter to help expedite containing the fire and preventing it from spreading to nearby structures. Water tenders were used to shuttle water to the scene. After approximately 90 minutes of battling the fire, that had grown to nearly 20 acres, the fire was deemed under control. No structures were burned and no injuries occurred as a result of the fire. The fire is under investigation; cause is unknown at this time. TVF&R was assisted by Lake Oswego Fire Department and Hillsboro Fire and Rescue. ⇐Previous National Homeland Security Association Honors Firefighter with ScholarshipNext⇒ Portland Metro Fire Camp a Huge Success!